MARQUETTE Educational Opportunity Program benefits students and communities “A scholarship is not for free — you have to work hard to maintain it.” No one knows that better than Dr. Phu Tran, Eng ’04, Grad ’11. He was the first member of his family to graduate from college. At age 14, his family moved to the United States from Vietnam. “For my parents, they came here to give us a better future and they knew education was the way to that future,” Tran says. “For me, there was no choice. Whatever I had to do to go to college, I was going to do.” From the moment he enrolled in Pulaski High School in Milwaukee, attending college was his main goal. However, that goal presented many challenges. His parents couldn’t pay tuition and he didn’t know anyone he could talk with about the admissions process or college life. That is, until a friend of the family offered him some life-changing advice. “He was a college graduate and went through the Educational Opportunity Program. He told me to apply,” recalls Tran. “So, after school one day, I hopped on a bus to Marquette’s campus. I went up to the EOP offices in Marquette Hall and asked about their programs.” He went on to apply for the Upward Bound Math-Science summer program designed for low-income, first-generation high school students. He was accepted and participated in the program, which helped him excel as an undergraduate. “Without that program, I would have been way less prepared compared to my classmates (at Marquette),” Tran says. “I had the drive to work hard. Knowing that my family would not have the financial support to send me to college, I had to work harder to maintain (my scholarships).” Marquette’s four federally funded TRiO programs (Upward Bound, Upward Bound Math-Science, Student Support Services and McNair Scholars) make college and graduate school a realistic option for low-income, underrepresented and first-generation students like Tran. Each year, Marquette’s TRiO programs help more than 500 high school and college students achieve their goals. 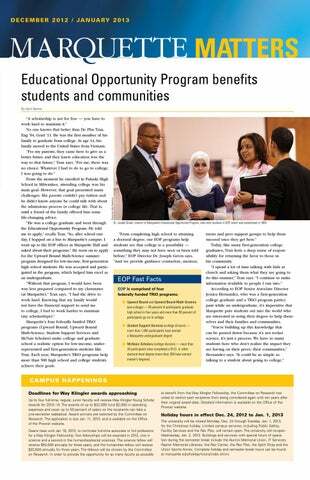 Dr. Joseph Green, director of Marquette’s Educational Opportunity Program, talks with students in EOP, which was established in 1969.
to benefit from the Way Klingler Fellowship, the Committee on Research has voted to restrict past recipients from being considered again until ten years after their original award date. Detailed information is available on the Office of the Provost website. Holiday hours in effect Dec. 24, 2012 to Jan. 1, 2013 The university will be closed Monday, Dec. 24 through Tuesday, Jan. 1, 2013, for the Christmas holiday. Limited campus services, including Public Safety, Facility Services and the Rec Plex, will remain open. 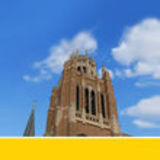 The university will re-open Wednesday, Jan. 2, 2013. Buildings and services with special hours of operation during the semester break include the Alumni Memorial Union, IT Services, Raynor Memorial Libraries, the Rec Center, the Rec Plex, the Spirit Shop and the Union Sports Annex. Complete holiday and semester break hours can be found at marquette.edu/holiday-hours/index.shtml.